6 months free Primo membership included with purchase! what's this? EastWest's ProDrummer™ not only includes professional drum sounds; the producers, who record and mix the biggest artists in the music business, have included pre-mixed drum kits for use in your compositions using the 'state of the art' tools included in the ProDrummer software. "At EastWest, we're all about the 'sound'; that's the only part that ends up in your track, so, in addition to the producer pre-mixed drum kits, we have included our favorite effects processors including Solid State Logic EQ and Dynamics, Transient Shaper, and the legendary SSL Stereo Bus Compressor; Ohmicide multiband distortion, compression, EQ and filter, which pretty much lets you create 'anything', and is perfect for EDM or media composers; plus EastWest's new Amp Simulator with 80 Amp Presets, and Expanded Convolution Reverb with 726 Additional Reverb Presets. Together these powerful tools enable user customization of the core sounds limited only by your imagination!" Also included in each volume are over 14,000 MIDI drum grooves in different styles. Search for the right grooves for your song with our groove 'search engine' and assemble your song right inside ProDrummer with the built-in sequencer (or drag to your DAW). Use our built-in Velocity Processor to control the dynamic power of the drums. Export the song to your favorite DAW to build the rest of your track, it couldn't be easier! 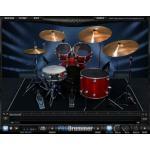 ProDrummer Volume 1 includes approx. 40 Gigabytes of Drum Kits and MIDI drum grooves produced by Joe Chiccarelli and multi-award winning EastWest producer Doug Rogers, with drums played by Matt Chamberlain (Pearl Jam, Bruce Springsteen, Peter Gabriel, etc.). ProDrummer Volume 1 includes Craviotto, Ludwig, Tama, Slingerland, Gretsch, Istanbul and Zildjian, drums, hi-hats and cymbals recorded in 3 different rooms. The sound shaping options in the ProDrummer Mixer are unparalleled with the usual high quality you expect from EASTWEST. All drums have their own channels with individual processing and routing. ProDrummer Volume 2 includes approx. 60 Gigabytes of Drum Kits and MIDI drum grooves produced by Mark "Spike" Stent and multi-award winning EastWest producer Doug Rogers, with drums played by Steven Sidelnyk (Madonna, Seal, Massive Attack). ProDrummer Volume 2 includes Drum Workshop, Slingerland, Gretsch, Ludwig, Yamaha, Orange County, Zildjian drums, hi-hats and cymbals recorded in 5 different rooms. The sound shaping options in the ProDrummer Mixer are unparalleled with the usual high quality you expect from EASTWEST. All drums have their own channels with individual processing and routing. Vol. 1 60GB free hard disc space; Vol. 2 40GB free hard disc space.